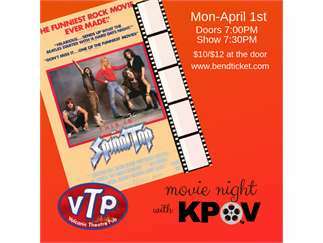 Join KPOV April 1st (no foolin’) for Movie Night with KPOV showcasing “This is Spinal Tap,” a movie some call the funniest mock-u-mentary or rock-u-mentary of all time. Get out the hairspray, let down your hair and come dressed like a rock star. Doors open April 1st at 7pm. The movie starts at 7:30. Tickets are available at BendTicket. “Movie Night with KPOV” is a fundraiser for your community radio station. Graciously hosted by Volcanic Theater Pub.